Some fresh blood for the Brainfeeder label, Jeremiah Jae is a Chicago native who somehow manages to blend the cut-and-paste of the LAFMS, the synthetic pulse of the BBC Radiophonic Workshop and rare groove of Madlib and emerge with something effortlessly engaging and shockingly coherent. Madlib might just be the best reference, but this is far from an exercise in second-rate ‘Unseen’ pastiches, just flip over to the Delia Derbyshire-esque ‘Stones Passage’ and prepare to have your brain cells frazzled by Jae’s genius-level of control over his unexpected, pulsing rhythms and the kind of bleeping, synthetic textures the Ghost Box set would be dribbling over. Elsewhere ‘$easons’ (which has been floating around the net for a while now) shows off Jae’s wordplay, and while it might be the straightest track on the EP is still undeniably peculiar with Jae swathing his low-key raps with a glorious sludge of noise, choppy rhythms and stuttering vocals. 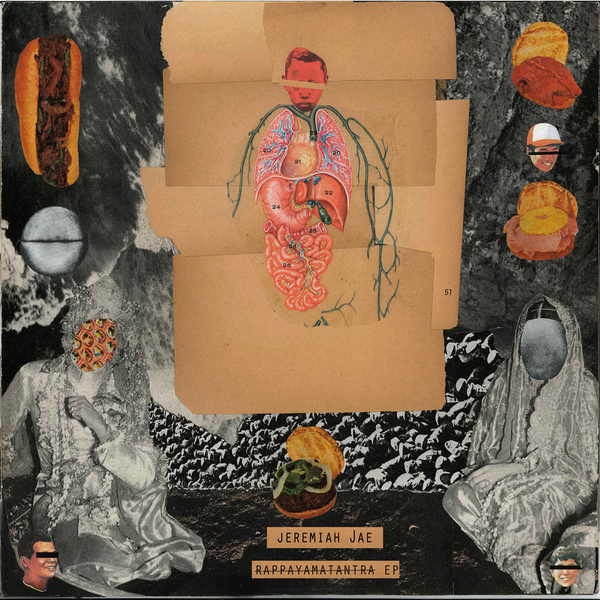 With ‘Rappayamatantra’, Jeremiah Jae has put more ideas into the mix than most artists inject into an entire album, and there’s no reason I can think of for any followers of post-rap, wonky or whatever the media is labeling this stuff right now to grab this without any further delay. Seriously one of the most exciting EPs I’ve heard in ages – a huge recommendation.